Besjana Hoxha is three years old. Her birthday is July 31st 2015.She is in good health and at present is staying at home. Her mother cares for her while she plays indoors and uses her few dolls. Her favorite color is blu. 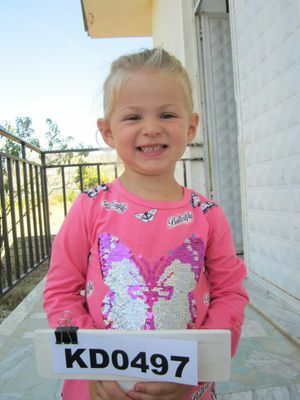 Besjana’s future dream is to be a doctor and be close to the people who are sick and in need. Her mother cares to take her to our feeding programme centre at Kotodesh. Besjana is the only child in her family. Besjana attends regularly twice a week, every Tuesday and Friday our feeding program at Kotodesh, enjoying the combined meals cooked and served to the participating children. Her mother sits with her to feed her and she is enjoying the fried chicken, sausages, pasta and rice served by our cooks. She attends the Bible classes for the children who are same age with her and enjoys singing to Jesus and learning how to pray. At the end of the Bible lesson, she and the other children spend time to play altogether at our feeding centre under the care of our teachers. Same as all families in the village of Kotodesh, this family owns a portion of land. They usually planted vegetables and crops for self consumption. At present the mother is trying to preserve some vegetables in vases to be used during the winter. The father is jobless and working only in the lands doesn’t give him too much of income to support all the needs the family has. Whenever he finds a possibility to be hired in the village he does work to earn a bit more.